An orphaned baby elephant has been fully accepted into a semi-wild elephant herd at Camp Jabulani outside Hoedspruit in a rare success story. The baby elephant, Timisa, which means courageous in Xitsonga, who was rescued in November last year at Umbabat Reserve near Kruger National Park by Elephants Alive, is thriving under the care of her adoptive family. The tiny female elephant, extremely dehydrated when found, was the calf seen a few weeks earlier trying to suckle from her dying mother. Since there were lions in the area and the calf had little chance of surviving, permission was granted to move the calf to a safer area. After a first night spent under the warmth of heating lamps, the traumatised baby elephant was introduced to her new family which immediately accepted her in a manner unusual of typical elephant behaviour. Human emotions ran high as the matriarch, Tokwe, allowed the calf to comfort feed while the rest of the herd greeted her eagerly with streaming temporal glands and loud trumpeting. 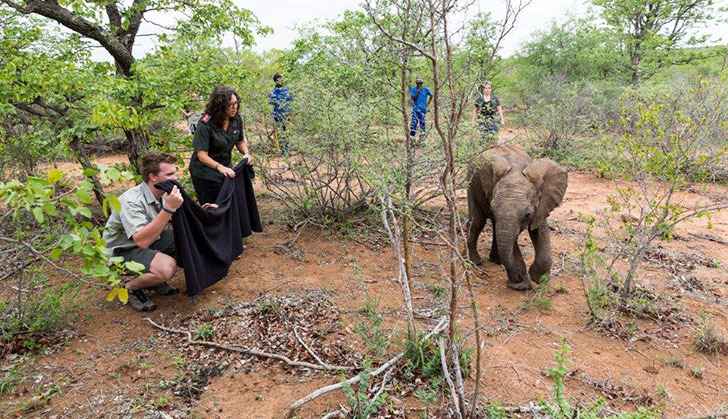 "Tokwe's daughter, Limpopo, couldn't stop touching the little one and she was soon corralled amongst the pillared legs of all the females," said Harriet Nimmo, marketing manager of Elephants Alive. "Then they set out into the bush with the grooms in tow and never let the calf out of their sight." "There are isolated cases of orphaned calves adopted by wild herds but this does not happen often and it is probably more likely for a lactating female within the same herd to adopt an orphaned calf," says Dr. Michelle Henley, CEO and co-founder of Elephants Alive. Camp Jabulani is home to 14 semi-domesticated elephants, rescued from a culling program in Zimbabwe over 20 years ago, who now roam in a natural environment under the supervision of keepers, who protect them from potential conflict with wild elephant herds on the reserve. Six months later, Timisa has adjusted perfectly to her new life and her adoptive mother, Limpopo, who has strongly bonded with her new baby. Although South Africa's elephant population has historically been stable, ivory poaching, which has seen 30% of Africa's elephants wiped out in the past seven years, is now on the rise in the Kruger National Park with more than 80 elephants poached in the past 18 months. "The survival of one elephant can make a difference and open a new world of thinking to us. It may be time for us to change our conservation focus so that we never have to apologise for having compassion for an individual," says Dr. Henley.